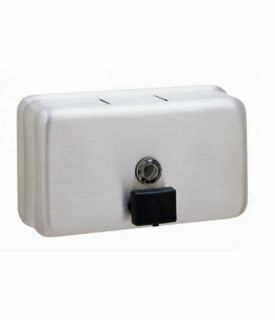 Дополнительная информация: Stainless steel tank-type soap dispensers have 40-fl oz. (1.2-L) capacity. Units are easily filled from top through locked opening. Satin-finished 22-gauge (.759mm) tanks are welded to stainless steel backs. Unit has concealed backplate and sight level indicator. Valve is black molded plastic push button with antibacterial-soap-resistant plastic cylinder and stainless steel spring. Unit 8 1/4" W, 4 3/4" H, 3" D (210 x121 x 76mm).